We know you love feeding your baby healthy first foods. Have you thought about introducing other healthy habits to your little one? 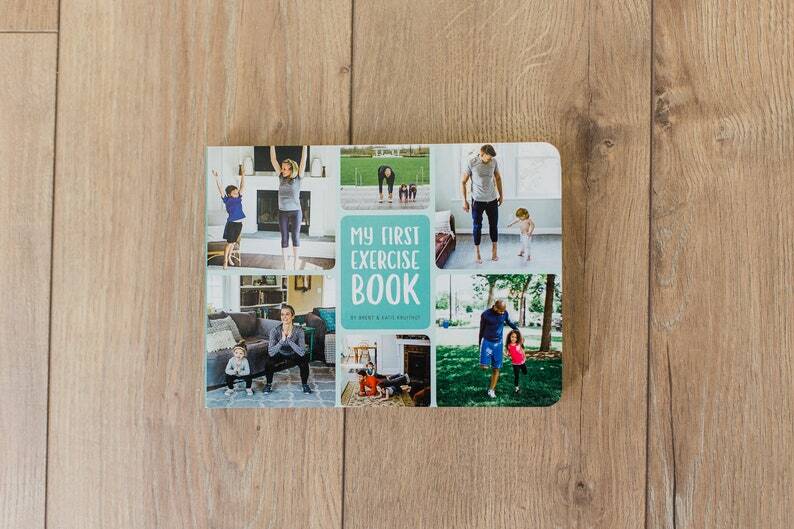 My First Exercise Book is a beautiful and fun photography board book designed to motivate parents to be active with their young kids. The photos in this book all include children and adults exercising together with short explanations and tips on how to perform each exercise. The result is a perfect way for parents and kids to get up and actually try out the exercises in the book. Fitness guru and entrepreneur, Brent Kruithof, loves to exercise with his kids. His family workout videos have over 50 millions views and are often featured on media outlets around the world. Brent and his wife Katie’s passion for family togetherness inspired them to create a fun and colorful children’s book which not only promotes strong bodies but strong families too. My First Exercise Book includes only exercises that use body weight resistance, which is the safest way for kids to workout. This book includes the foundational exercises that have been included in physical education classes for decades because they are not only safe for kids, but they are vital for the proper health and develop of young people. This is a high quality board book with accurate photo illustrations of exercises! Such a great idea for establishing healthy habits with your child. This is hands down my favorite etsy shop! There are so many cushions and mats to select from, I never thought I would be so excited about a high chair!